Radiotherapy is used in the post-prostatectomy setting, as an adjuvant treatment for patients at high risk of local recurrence, or as salvage treatment in patients with biochemical failure. While late grade 1-2 rectal toxicities are not uncommon, the risk of late grade 3-4 rectal toxicities is often reported to be <5% at PPRT doses of 60-64Gy. The use of dose escalated PPRT can result in increased late grade 3-4 rectal toxicities. The use of hydrogel spacer (HS) in intact prostate RT is well-established. However, there is very limited data on the use of HS for PPRT. We aim to report on feasibility of HS insertion for PPRT based on our institutional experience. Four consecutive patients referred for PPRT who had radiological (PSMA PET) or histological evidence of local recurrence were considered for HS insertion. The HS was inserted into the plane between the local recurrence and anterior rectal wall. Pre-HS and post-HS CT planning scans were performed, and the rectal dosimetry for both planning scans were compared. The dose to the radiological or histological confirmed local recurrence was escalated to 75.6Gy in 1.8 Gy fractions, with 67.2Gy in 1.6 fractions to the rest of the post prostatectomy bed using volumetric arc therapy (VMAT). All 4 patients successfully underwent their HS insertion. No patients reported bleeding, infection or allergic reactions following the procedure. The distance between the rectal wall and local recurrence was increased from immediate vicinity to a mean of 12mm (11-15mm) after hydrogel spacer insertion. The HS had an influence on all rectal dose endpoints with a more significant impact at higher doses. The difference for pre-HS vs post-HS plans were 11.9% for rV30 (79.9 vs 70.3), 12% for rV40 (65.9 vs 58), 14% for rV50 (56.1 vs 47.7), 20.3% for rV60 (45.4 vs 36.1); 51% for rV70 (21.1 vs 10.4); 92.9% for rV75 (6 vs 0.4) and 100% for rV78 (0.06 vs 0). 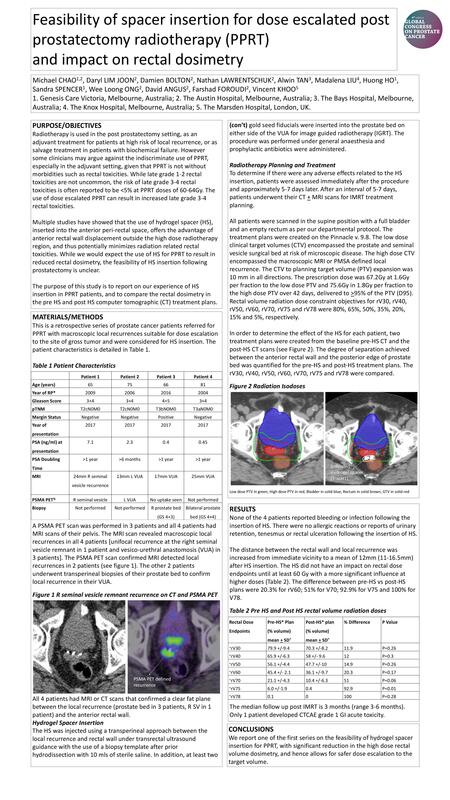 We report one of the first series on the feasibility of hydrogel spacer insertion for PPRT, with significant reduction in the high dose rectal volume dosimetry, and hence allows for safer dose escalation to the target volume.